I found myself suddenly churchless. That’s the best way to describe it. Despite being deeply betrayed by a pastor whom I thought loyally supported and encouraged me, I knew something much greater, much more meaningful and important awaited. I imagine a worm curled up in a chrysalis. The opaque, glassy shell surrounds the worm in darkness. Deep, unbroken, total darkness. Then, after a period of transformation, the chrysalis breaks apart. Pinpricks of light fight their way through the semi-transparent gloss. And as the shell crumbles, beautiful wings snap out, and from the secluded darkness of a worm home comes the dazzling beauty of a butterfly. When the facade of that so called holiness church evaporated under the mighty Light of YHVH, my entire life transformed, leading me beyond church . . . and right back to the ancient paths. Only about a month after being tossed out of that holiness church, I found myself on a crisp, cool, February day preaching to a crowd of a hundred or so students at Portland State University. A few weeks ago, I had been delivered from a forty hour a week telemarketing job and landed a position at The Oregonian. Working in the matrix of cubicles that formed The Oregonian’s basement, I found that this new inside sales job not only paid me almost three times the amount as my previous job, but now I only had to work for about 27 hours a week. “This is such a blessing, Daniel.” My wife agreed. “I’ll meet you there!” My wife said excitedly. And so my ministry at Portland State University was born. I remember that first day very well. My wife pushed the blue and white stroller with our sleeping newborn nestled inside. Though the trees on the park blocks were bare and leafless, the bright blue sky and warm sun quickly transformed the winter’s day into an almost Spring feeling. Now being raised as a good Christian non-denominational boy, my knowledge of the Levitical Law was very limited. But as the girl began to try and point out contradictions, the Holy Spirit showed me again and again how foolish her arguments were. At the same time, I began to realize, as the Spirit helped me to contend, that the Levitical Law was perfect, beautiful and supremely reasonable in all its facets. A crowd of 100 soon swelled to 200, and the Spirit gave me one response after another, showing me how to defend the Levitical Law -- magnifying it in all its beauty. Trembling, I began to wonder in awe at how incredibly sober the crowd was. Conviction was falling in waves as I had never seen before. Something truly new and different birthed that early afternoon on campus. After preaching for a number of hours, a tall, lanky student with long dark hair approached me. His narrow face, pecked with a black goatee, could not hide his wide grin as he thrust out his hand to shake mine. My jaw dropped as I shook his hand. “Well, actually, that sounds wonderful. I just got thrown out of a church, and we’ve been looking for someplace new.” Goosebumps pebbled my arms, for I knew this was no chance meeting. The Messiah was leading me exactly to where I needed to go. “Great! We meet on Saturday afternoons and Saturday evenings. Here are the directions.” He handed me a piece of paper with the instructions. I recalled from years ago, just as a little child, when my mom would pull out Messianic Jewish records. In fact I vividly remember a faded blue Star of David etched on the cover of one album. Then there were the many nights when my family crowded around our television and watched, and re-watched our all time favorite musical -- Fiddler on the Roof. That Saturday evening, I stepped into a completely different world. The dimly lit auditorium could not hide the bright joy on many of the faces. As my wife and I took our seats on the plush chairs, wedging the baby stroller between us, I looked over in awe at the dancers. I had been to many different types of churches, but never had I seen a line of dancers so coordinated, fluid and heart-breakingly beautiful. The minor chords of Hebrew music filled the sanctuary, and to my astonishment, a short man with spectacles lifted a long, curved horn to his lips. What was that thing? As the horn pealed across the sanctuary, you could feel the weight of the Spirit move across the room. I would later learn that the pastor was blowing a shofar. After the intense time of worship and a brief message, the congregation hurried into a large basement where “oneg” was served. This was actually a fancy Jewish word to describe a lavish meal to either celebrate, or in this case, conclude the sabbath day. There seemed to be such love, such joy, such deep peace in this odd Jewish setup, that I knew beyond a shadow of a doubt, we had found our new church home. A few days later, a traveling Messianic teacher was hosting a special mid-week conference at the very same congregation. I told Annika we had to go, and invited Deanna, along with her twenty-eight year old son, Philip, to join us. After another time of intense praise and worship, I could see the glow reflected in Deanna and Philips’s faces. They knew the Spirit -- which I would soon learn could be called the Ruach -- was also operating here. The guest speaker, with a long thick beard and wearing these funny looking blue tassels, took the stage and began, bit by bit, demolishing everything I had ever learned. Using Matthew 5:17-21 as the cornerstone of his message, he artfully but emphatically showed that the Torah and Prophets were still just as relevant today as they were when handed down to Moses thousands of years ago. For the very first time, I began to see how the Levitical Law fit perfectly with what Jesus -- whom now I would learn was called YahShua -- taught and lived. He showed the paganism in both Easter and Christmas, and began elaborating on the Feast Days found in Leviticus 23, which YahShua and all His disciples celebrated. When the teacher had finished that first night, and the lights brightened, I could see a troubled look of anxiety on the faces of my wife, Deanna and her son. Evidently, they were far more troubled by what we had heard. As I excitedly grabbed my wife’s hand, pulling her through the crowded sanctuary toward the back where they were selling various teachings and audio tapes from the guest speaker, I could barely contain my excitement. “I just don’t know about this, honey. It’s all so . . . so different than what we were raised with,” she said, unable to shake the troubled look from her face. My wife couldn’t argue with that. My wife had never been as much into Christmas as me, so she didn’t protest. Ironically, the revival that had swept our house had pretty much relegated Christmas to the side-lines anyway. Now I better understood why! Armload after armload, I heaved every last bit of Christmas decor into our dumpster. As I did so, I only felt more of the Ruach burning brighter and hotter within me. I knew I was placing a smile of joy on my Creator’s Face! The next night, we attended round two of this Messianic guest speaker’s teachings. Deanna and Philip declined to return. They just couldn’t accept that so many in the church world had gone wrong. About five years later, I would learn that Deanna, called by the Spirit, would begin attending this very Messianic congregation on a regular basis. I approached the Messianic teacher after he finished. I waited in line, chomping at the bit for my turn to speak with him. “Shalom!” I said for the first time, testing out the new word in my mouth. “Shalom,” he spoke back to me in a deeply rich and warm voice. I explained to him about my ministry of doing open air street preaching at Portland State University. And thus my transformation began. Over the next several months, as I preached day in and day out on campus, hecklers would begin to hear my new message of returning to the Torah out of a love for the Messiah. “Tzit-tzit? What are those?” I wondered. Time and again, one heckler after another, trying to embarrass me, or prove that I would not really live what I was preaching, actually helped me learn the Torah! Over the next year, I went from a freshly shaved Christian street evangelist, to a bearded, tzit-tzit wearing, sabbath preaching, Feast keeping, Messianic preacher. 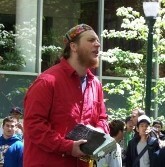 One article in the Portland State University newspaper declared in its headline: PREACHER DAN INVENTS HIS OWN RELIGION. But for all the mockery and heckling, YahShua used me to exalt the purity of His Torah to these students, introducing many of them for the first time to what the Bible actually declared. About nine months later, my wife had our second baby -- Elijah Thomas Lee. Weighing in at just over 6 pounds, with a red, scrunched face, and two beautiful eyes, a Truth dawned on me as I held that little body in my arms. I needed to get him circumcised in eight days. I frantically began to call various hospitals and moyels to figure out how to have Elijah circumcised on the 8th day. Because we had used a midwife for the birth, hospitals were reluctant to help us out 8 days later. Moyels were even more reluctant because the eighth day from Elijah’s birth happened to fall squarely on a shabbat. Since Annika and I were not technically Jewish, every moyel we spoke to refused to perform the procedure. 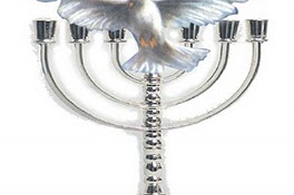 As the eighth day approached, a deep shalom filled my heart. I knew, somehow, someway, Yah was going to make a way for us to keep His Torah and have Elijah circumcised. “What a thing to do!” He said in a light hearted tone. “Can you help us?” The trend in both the medical and naturo-path community had been against circumcisions, so I wondered if this man would do what we were asking. The next morning, on shabbat, we arrived at his small office in downtown Portland. As Annika gently laid Elijah on the table, the naturopath pulled me aside. “I need to let you know something. I often do circumcisions for Jewish couples. And just a few days ago, one of the Jewish couples left this with me,” he said as he pulled open a drawer. My eyes widened. A deep blue zippered cloth pouch lay in the drawer. White, Hebrew letters traced their way in beautiful stitching across the blue pouch. I lifted the pouch into my hands and pulled open the zipper. “It is an original hand made tallit from Jerusalem,” he said. The soft, glossy material of the Jewish tallit slid from the pouch. Hand stitched images of Jerusalem covered the tallit. “I would like you to have it. I think you will get more out of it, Daniel, than I ever will,” he said. As I deeply thanked him, I pulled the tallit over my shoulders and prayed over my 8 day old son as the naturopath cut away his foreskin. For years I kept that tallit, wearing it on my shoulders whenever I would preach at Portland State University. It was a visible testimony to the amazing gift YahShua poured into my heart and life of returning to the ancient Hebrew Roots of the faith.